LeMans, 1977. 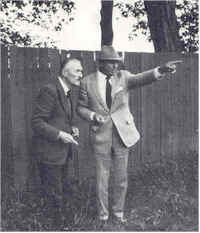 Henri Delgove, left, recalls to Harry Combs Wilbur Wright’s electrifying flight of August 8, 1908, which he witnessed as a boy of 13 and announced to the town. Harry Combs’ Gift Brings the Flyer Home Thanks to the generosity of Harry B. Combs, a full-scale, authentic reproduction of the 1903 Wright Flyer will become a permanent exhibit at Wright Brothers National Memorial. Combs, noted pilot, author and former president of Gates Learjet Corporation, donated the accurate Flyer reproduction as a gift to the American people on December 17, 2003. “Many advances in the way we live and the comforts we enjoy are the direct result of this little Flyer and the scientific research it spawned. In 1917, just 14 years after the Wright brothers flew here at Kill Devil Hills, I watched my father learning to fly with the Royal Canadian Air Corps at Deseronto, Canada and my passion for flight was born. It has been my joy that I have been able to live my life in the rarefied field of aviation and I am proud to be able to give this gift to the American people. The gift of the Flyer was announced in spring 2003. “Visitors to the site of history’s first powered flight will see an exact reproduction of the original airplane, the Wright Flyer, that flew there in 1903,” said Combs. The reproduction of the very plane with which Orville and Wilbur Wright made their historic first flights on December 17, 1903 has been built with over $1 million donated by Combs. The plane will be dedicated in a ceremony on December 17, 2003 — one hundred years to the day that the Wright brothers made the first manned, powered, controlled, sustained flights. Joining Harry Combs for the special dedication ceremony at 1 p.m. on the Main Stage will be Apollo XI astronaut Neil Armstrong and Senator Ted Stevens (R-Alaska), both long-time friends of Combs. The flyer will then be on permanent display at the Visitor Center at Wright Brothers National Memorial in Kill Devil Hills, N.C.
Planning for the construction of the reproduction started in January 2002 to ensure its readiness for the 100th anniversary of flight. The Wright Experience of Warrenton, VA, has built the flyer using reverse engineering based on the Wright brothers’ writings, letters and photographs. Harry Combs is a noted aviator, historian, author and businessman. The Colorado native, who passed away on December 27, 2003, has personally lived and breathed the Golden and Jet Ages of aviation. He saw his first airplane at the age of four-and-a-half. As a young boy in school, Combs was spellbound while reading Diary of an Unknown Aviator, the renowned World War I chronicle by Elliot White Springs. Combs’ father, Albert, was shot down twice in that war, and admonished his son never to set foot in an airplane. Undaunted, the determined young Combs paid $2.50 for a ride in a mail plane at the age of 13; then, two years later, inspired by an advertisement for $99 flying lessons, made his way to St. Louis, MO for three hours of flight instruction and immediately soloed thereafter. He helped design, build and flight-test his first airplane, Vamp Bat, a sport biplane, at age 16. After graduating from Yale University with a degree in applied economics, Combs worked a short stint with Pan American Airways; ran a small flying service in Armonk, NY; dabbled in investment banking and served as a second lieutenant pilot officer for the Colorado National Guard where he quickly logged enough flying time to earn an instructor’s rating. In 1938, Combs, then 25, founded Mountain States Aviation, a fixed-base operation that later became Combs Aircraft. During World War II his company turned out 9,000 military aviators. In addition to training pilots, Combs joined the U.S. Army Air Force Air Transport Command and flew C-54 troop transports over the North Atlantic, Africa and India. Following the war, Combs Aircraft became one of the largest and most successful networks of aircraft sales and service centers in the country. The business practices Harry Combs created are now accepted industry standards. In 1961, President John F. Kennedy appointed Combs to Project Beacon, a special task force that modernized the nation’s air traffic control system. Many of Combs’ initial concepts are still used in air traffic control today. He also served as a technical advisor to NASA in the early stages of the national space program. As president of Gates Learjet Corporation from 1971 to 1982, Combs guided the jet manufacturer to new heights in corporate aviation, and further left his mark on the aviation industry through his efforts to promote flying safety. Under his direction, the Learjet became the first U.S. civil aircraft to be FAA-approved for normal cruise at 51,000 feet. It was also the first plane to use NASA’s thrust-enhancing “winglet” technology, a feature widely used on modern-day aircraft. Combs has received numerous honors and awards for his work in aviation, including the Wright Brothers Memorial Trophy; the National Aeronautic Association’s “Elder Statesman of Aviation” award; the FAA’s Distinguished Service Award for leadership in promoting flight safety; The Wings Club’s Distinguished Achievement Award for contributions to the development of the aviation industry; and General Aviation Man of the Year. 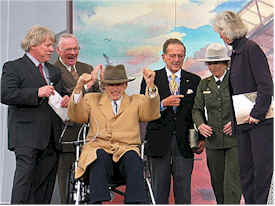 Combs is an honorary member of the Lafayette Flying Corps and has been inducted into the National Aviation Hall of Fame, and the Colorado and Arizona Aviation Halls of Fame. Combs’ own realization of the Wright brothers’ genius came later in his life. Studying their papers ignited a passion in Combs, and a dedication to share their story. His noted work on the Wright brothers, “Kill Devil Hill: Discovering the Secret of the Wright Brothers”, won the James J. Strebig Memorial Trophy, the Aviation/Space Writers Association’s highest award for excellence in aviation writing. Combs also produced an educational video, “How Strong is the Wind?” based on his book, which has been widely praised for illuminating little known facts about the Wrights. Combs’ donation of the reproduction of the Wright Flyer furthers his mission to educate and enlighten others to the great contribution made to mankind by the Wright brothers.